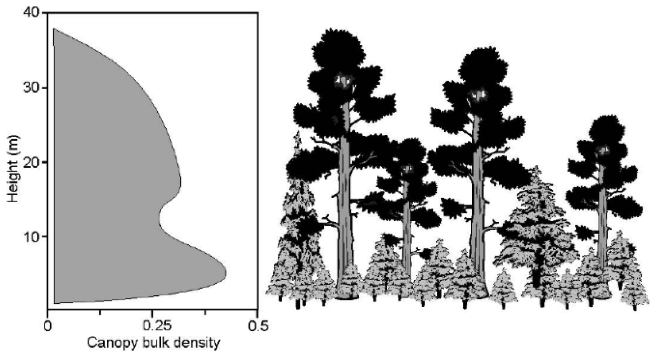 The forest Canopy Cover (CC) describes the percent cover or cover class of the tree canopy in a stand. Specifically, CC describes the vertical projection of the tree canopy onto an imaginary horizontal surface representing the ground’s surface. Estimate of CC is used in adjustment of 20 feet winds to mid-flame, fuel moisture conditioning and spotting distance models. The scale illustrates representative CC percentages and ranges within each cover class. The Stand or Canopy Height (SH) describes the average height of the top of the vegetated canopy. SH estimates are used in adjustment of 20 feet winds to mid-flame and in spotting distance models. The forest Canopy Base Height (CBH) describes the average height from the ground to a forest stand's canopy bottom. Specifically, it is the lowest height in a stand at which there is a sufficient amount of forest canopy fuel to propagate fire vertically into the canopy. Using this definition, ladder fuels such as lichen, dead branches, and small trees are incorporated. Estimate of CBH is used in the Crown Fire Initiation model. 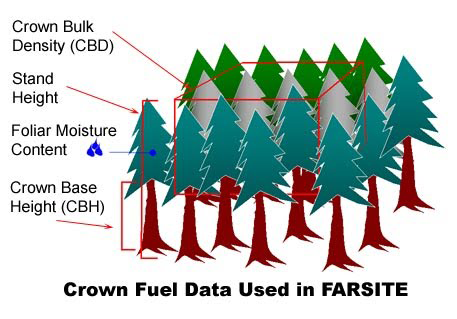 The forest Canopy Bulk Density (CBD) describes the density of available canopy fuel in a stand. It is defined as the mass of available canopy fuel per canopy volume unit. 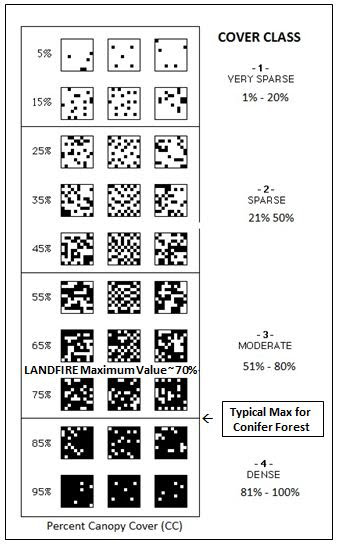 Typical units are either kg/m3 (LANDFIRE default) or lb/ft3 (BehavePlus default). CBD estimates are used to determine the threshold spread rate, or surface wind speed, used to determine the likelihood of active crown fire. 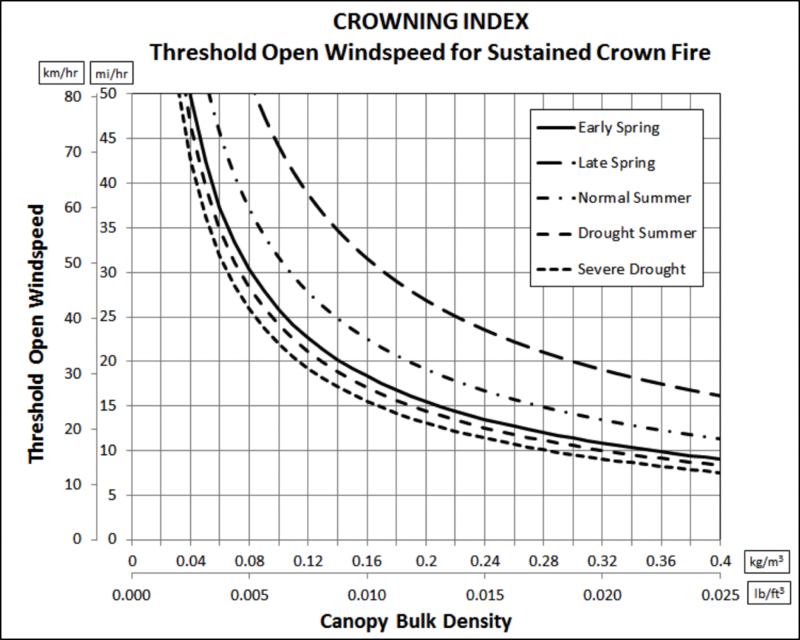 The following graph, also displayed in the Crown Fire section under Crown Fire Initiation and Propagation, displays the threshold surface 20 feet wind speed or Crowning Index, necessary for producing active crown fire given a specific canopy bulk density.